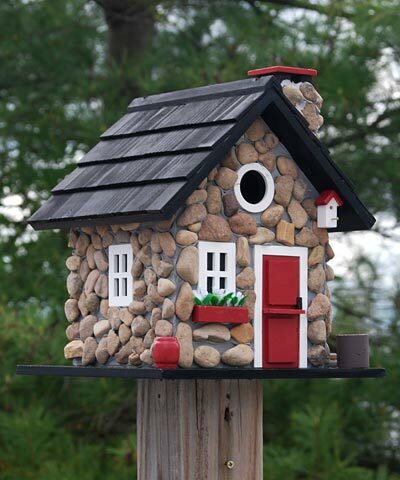 Create an enchanted feel in your bird garden with the Home Bazaar Windy Ridge Stone Bird House. Blending style with realistic details, this cottage will certainly bring a charming touch to your home or backyard in moments. The stone covered façade lends a rustic feel to the piece, furthered by the faux wood pile, bird house, and window box with fabric flowers. A 1.25" diameter entry hole sits at the top of the unit, allowing wrens and chickadees to roost in it. The pitched roof protects the entry from rain, and its wooden shingles and black color add drama. Ventilation slots run beneath the roof overhang on the sides of the shelter, helping maintain a proper internal temperature. The spacious interior provides room for an entire avian family, and screening beneath the entry hole allows fledglings to reach it easily when ready to exit the home. Use the included mounting plate to display this unit on a 4 x 4 wooden post (not included), or hang it using the included hardware. The wooden and stone body is perfect for use indoors or outside, and the amazing details will certainly capture attention. Add a magical look to your bird sanctuary with this Windy Ridge Stone Bird House. Note: Climate and the elements will weather the house and change its appearance over time; however, weathering will add to the house's natural charm without compromising its function. Should you want to preserve the finish (paint), it is recommended to cover it with several coats of a water-based sealant. You should expect that once left outside, the product will weather and require refinishing.